Ever feel stressed and reach for ice cream? Find yourself grabbing a whole sleeve of cookies after a fight? Do you swear you’re eating the same amount as usual, but blame your weight gain on a major life change? Stop blaming stress – instead blame your fork! 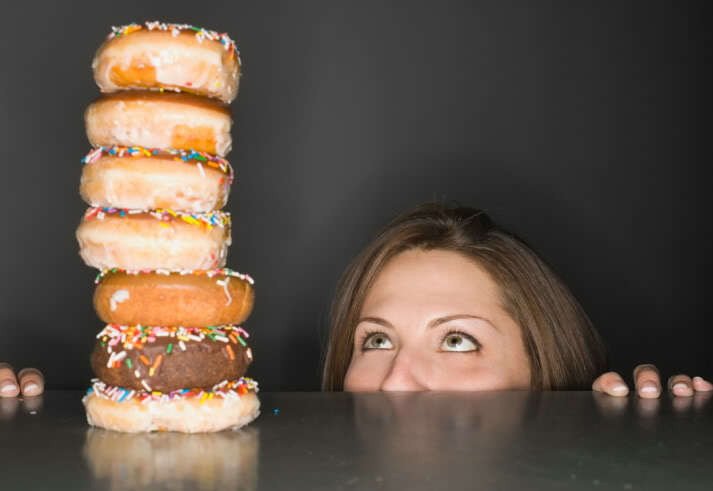 You may be eating more when you are stressed without realizing it! Researchers found psychosocial stress led people to eat 25% more than when relaxed! So, those extra pounds are most likely from extra calories! Eating an extra quarter plate of food makes sense for physical stress. For example, if you burn a lot of calories in the weight room you will need more calories to repair your muscle and replenish energy stores. But, why do people eat more when they are mentally stressed? With mental stress, your brain is the muscle at work! Your brain works harder and burns more calories than usual – but the rest of your body is not in calorie burning mode. 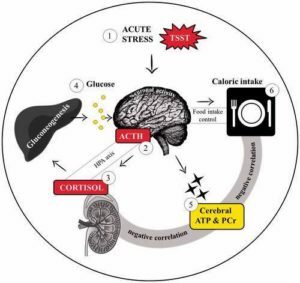 Your stress hormones help to release stored energy from your liver to give your brain a boost. But, you also get the urge to eat! If you eat 25% more than usual after physical activity where significant calories have been burned your needs will be met and your weight will stay stable. But, if you eat the same 25% more after mental stress where fewer calories are burned you will end up with a calorie excess and weight gain. So, it’s not the stress – but the extra food you’re putting in your mouth that’s adding inches to your middle! Now that you know you are likely eating 25% more when you are stressed, what can you do about it? Recognize the real issue and your real need. Be mindful of your stress and your reaction to it. Ask yourself: How do I feel? Why do I feel this way? What do I really need? You know you will crave ice cream, candy and chips when you’re stressed. Instead have lower calorie food options available like cottage cheese, fresh fruits, and vegetables close at hand. Being dehydrated is a significant stressor. Instead of reaching for food, reach for that filtered water tap. Add some cucumber or lemon slices for a bit more satisfaction. Burn off the cortisol with exercise. Take an unfamiliar route and enjoy the views. If avoiding food is making you feel worse make yourself a deal and stick to it. Have a brownie and really enjoy it. Be mindful of every bite and be thankful for how wonderful and relaxed it makes you feel in that moment. Offer the rest of the batch to your personal trainer!